Home > Law Books > Treatises > Federal Research Coordinator, 2018 ed. Federal Research Coordinator, 2018 ed. 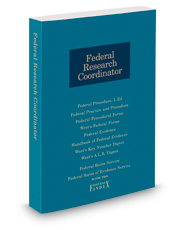 This reference tool provides quick access to Federal Procedure, L.Ed. ; Federal Practice and Procedure®; Federal Procedural Forms; West's® Federal Forms; Federal Evidence; Federal Rules Service; Federal Rules of Evidence Service; and West's Federal Practice Digest®. The Federal Rules of Civil Procedure, Federal Rules of Evidence, and Federal Rules of Appellate Procedure are arranged by rule number. The Administrative Procedure Act and Judicial Procedure Act are arranged by section. A research guide containing cross-references to Federal Procedure, L.Ed., and Federal Practice and Procedure follows each rule or section.